Camille Henderson was born in Vancouver, BC, in 1970. From the age of ten she was a working actor in film, stage and TV. At the age of fifteen she starred in the Canadian film directed by Sandy Wilson titled My American Cousin. She played the role of Shirley, a preteen girl. Her father, Bill Henderson, was a member of the Vancouver Sixties band The Collectors. He continued with most of his bandmates as they morphed into Chilliwack in 1970. Silvana Kane was born in Peru. When she was seven years old her family moved to Vancouver. Once settled in her new hometown, Silvana began to learn English, violin and piano. Though her family moved to Milwaukee (WI) and back to Peru, they settled again in Vancouver when she was 14. As a member of the West End Girls Silvana was billed as Silvana Petrozzi. 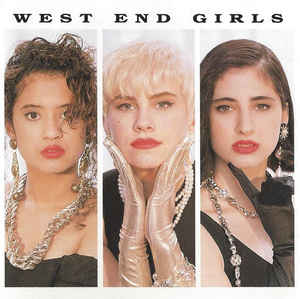 In 1990 the West End Girls formed as a trio with Silvana and Camille, and the third member of the group, Amiee MacKenzie. The West End is a downtown neighborhood in Vancouver. On its western boundary is Stanley Park. To the north is Georgia Street and the newer neighborhood of Coal Harbour. To the south is English Bay and False Creek. And to the east is Burrard Street with its adjacent neighborhoods Yaletown and Downtown Vancouver which includes the Granville Mall, Chinatown, Japantown and Gastown. The West End features Robson Street formerly known as Robsonstrasse, given the numerous German commercial businesses on the street. The West End houses many heritage buildings and has traffic calmed streets and bike lanes. A seawall along English Bay and False Creek is lined with a number of parks including Sunset Beach Park. Other parks include Alexandra Park, Morton Park with its A-Maze-ing Laughter featuring 14 bronze figures. The West End is also home to Western Canada’s largest gay community and the “gay village” on Davie Street. With 20-39 year olds the largest demographic, the West End is considered trendy and hip. In choosing to name their group the West End Girls, they were taking a name that already had wide recognition. Camille, Silvana and Amiee were each successful in auditioning for the group. The producer for the West End Girls, John Dexter, was the brainchild behind the group’s creation. Their debut (self-titled) album was released in 1991 and spawned two Top 40 singles and two Top 10 hits: “Not Like Kissing You” (which made the year-end Top 100) and “I Want U Back” (cover of the Jackson 5 song). The album was certified GOLD and The West End Girls received a JUNO nomination for Most Promising New Group of the Year. They toured with Roxette. “Say You’ll Be Mine” is a song describing two people on a date. It isn’t clear if they’ll see each other again. But at least one person is on the make. They turn on the radio and invite their date to dance. They also “turn the lights down low.” For one person on this date there is a physical attraction to the other person: “there’s a star shining bright every time you’re near.” The other person seems to be hesitating, given the lyric “say you’ll be mine, don’t make me wait… don’t let this heart break.” And so they are pressed by the person who’s turned on to “tell me those words that I need to hear.” The song offers a snapshot of the ambiguity of dating when it isn’t yet clear both parties are into each other. And yet, they are both curious enough to agree to go on another date. It seems they must have had a few dates given the one person is hoping to hear “those words” (99% chance they are “I love you”). “Say You’ll Be Mine” climbed to #9 in Vancouver and #14 in Hamilton. After “Say You’ll Be Mine” the West End Girls received a JUNO nomination for Most Promising Group of the Year. They lost the nomination to the Infidels. Later in 1992 Silvana Petrozzi left the group. Following her departure Camille Henderson quit. Petrozzi was replaced by Janele Woodley and Henderson’s spot was filled by Celia-Louise Martin. In 1993 the West End Girls recorded a second album title We Belong Together. In 1994 the group received a JUNO nomination for Best Dance Recording with the 12″ edit of “R U Sexin Me”. The following year their single, “Pure (You’re Touching Me)”, received a JUNO nomination for Best Dance Recording. As their second album undersold their debut album, the group broke up in 1994. After leaving the West End Girls, Camille Henderson became a backing vocalist for Sarah McLachlan. This included being with Sarah McLachlan’s Surfacing tour in 1997-98 that featured McLachlan’s giant hit “Building A Mystery”. Henderson was featured on the 1999 Mirrorball live album. As a backing vocalist with Sarah McLachlan, Camille Henderson appeared on the Grammy Awards, Saturday Night Live and the Juno Awards. Camille Henderson is a vocal instructor in Vancouver. In 2004 Silvana Kane (vocals) and Adam Popowitz (guitar) formed Pacifica, a world music band. They were joined by Toby Peter, from Salvador Dream, on bass and drums. In time the band changed their spelling to Pacifika. Between 2004 and 2014 they released four studio albums. Amiee MacKenzie joined an R&B group in Vancouver later in the ’90’s called D-Cru. The band released several albums in the late ’90’s and early 2000’s. D-Cru received a Juno nomination for Best R&B/Soul Recording in 2001 for “I Will Be Waiting”. More recently Amiee MacKenzie has been a swimsuit model. Janele Woodley went on to be part of the pop-rock duo A Perfect Day. Celia-Louise Martin went into acting. Camille Henderson biography, Camille Henderson.com. West End Girls, Isle of Deserted Pop Stars, March 15, 2008.